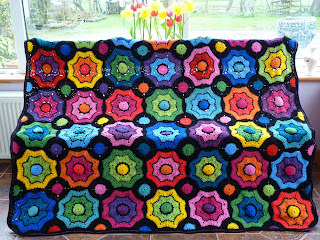 Thank you to everyone who was kind enough to comment on the colours used in the Realta afghan. 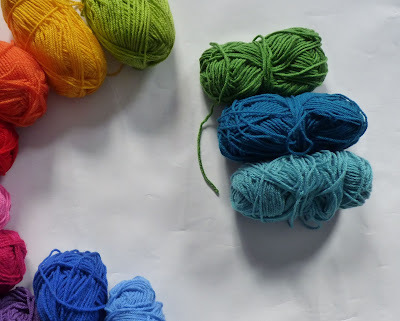 I've had requests to do a kind of colour tutorial or guide for those of you who want to make something similar. 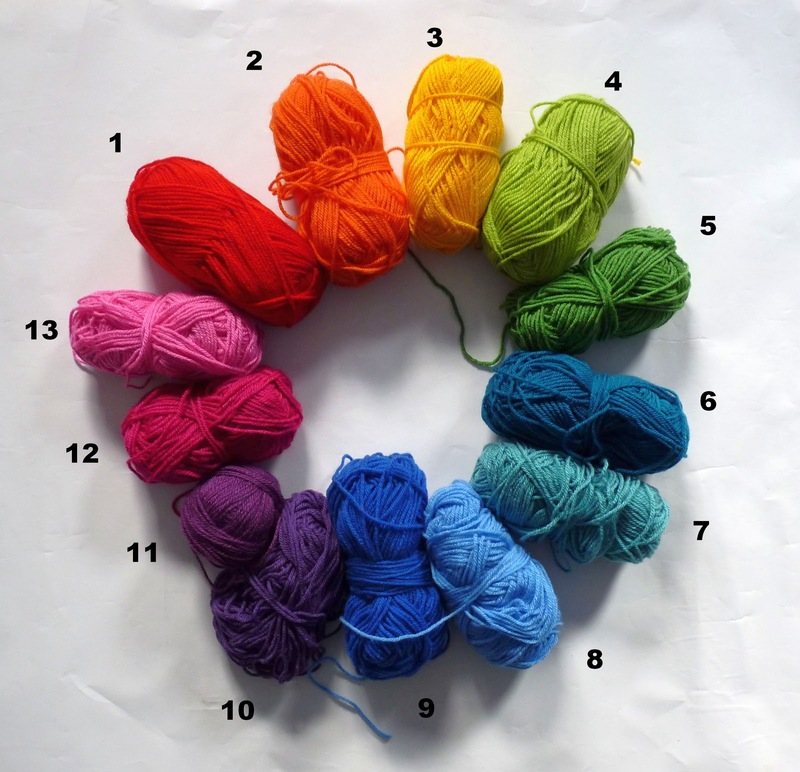 I'm going to try to explain how I organised my colours in a layperson's terms (because I am a layperson!) and I hope I succeed in doing so. If I had known that the pattern would become as popular as it is, I would have charted its progress carefully - as it was, a lot of it was done by just following a few guidelines I set out in my head. I'm going to try to explain these guidelines to you as best I can! My leftovers. Enough to start the next one! 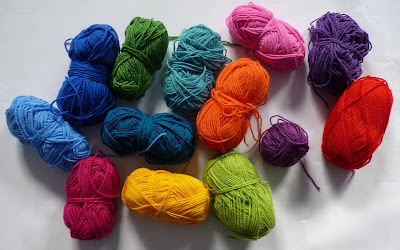 The next step is to organise your colours into a rough colour wheel. 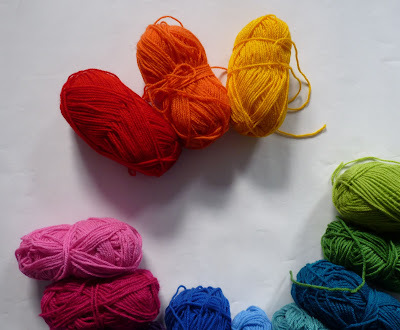 You want your colours to look like a circular rainbow - red - orange - yellow - green - blue - purple - pink - red. I used thirteen colours, plus black. Looking at the photo now, I'd change colours 12 and 13 around. When I was originally designing the blanket (= which might make you think I was sitting at a desk surrounded by charts and colour samples. I wasn't - I was probably in bed or waiting for a bus or eating my lunch), I wanted each octagon to be harmonious. 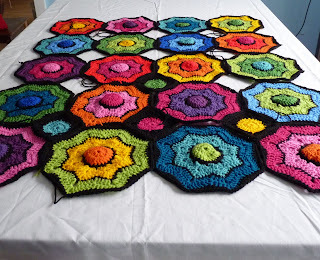 I wanted each octagon to build a single block of colour. And I wanted that octagon to form a contrast to the octagon next to it. For example, look at this octagon. It's deliberately small because I want you to squint your eyes and look at it as a block of colour - you should see one bluey-green blob. In this octagon you can actually see three separate colours that blend together to form a single unit of colour. Now look at the photo of the finished blanket - again, pull back from your computer screen and squint a bit. You should see blobs of colour: a reddish blob next to a blueish blob next to a pinkish blob and so on. I think this is one reason why the blanket looks harmonious in its randomness: there is a colour unity within the octagon, the contrast is only seen when the octagon is placed next to a neighbour from a different colour family. How do you make a 'unit of colour'? 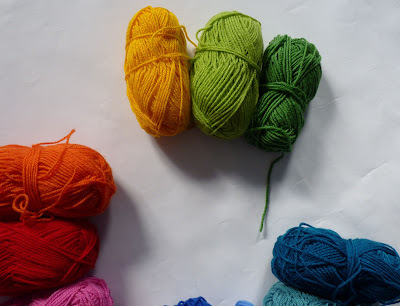 I formed units of colour throughout by choosing my colours according to my rough colour wheel: I tried (as far as possible) to choose three yarns that came side-by-side in my wheel and used these colours in the octagon. For example, I did a red/orange/yellow octagon, an orange/red/yellow, a red/yellow/orange, an orange/yellow/red etc. Same thing: apple/lime/yellow, yellow/apple/lime, lime/apple/yellow etc. Method in my Madness. Sort of. 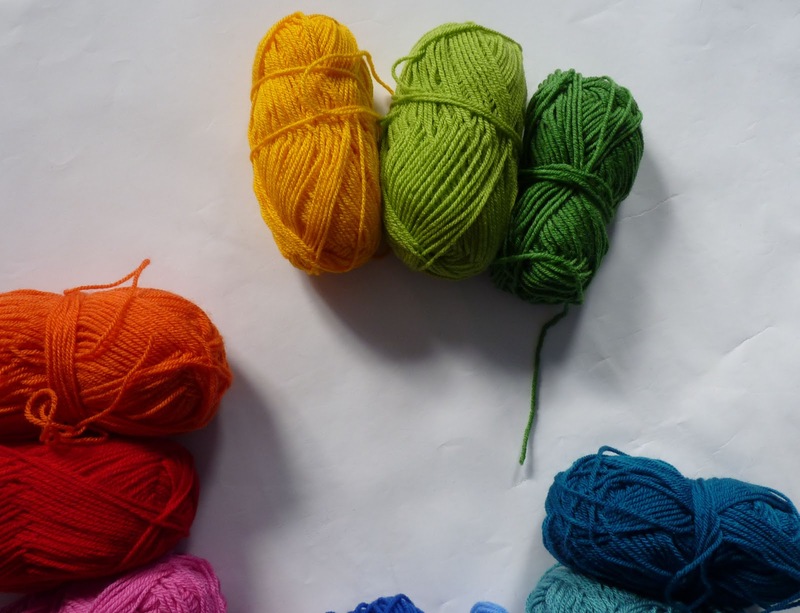 When it came to putting the blanket together, I resisted the very strong urge to make a list, a diagram, a chart and an Excel file (which I love doing. Nothing like a list to gladden the heart) and simply relied on my powers of squinting to arrange the blanket in a pleasing way. I put the motifs side by side, stood back, squinted and tried to make sure that there wasn't too much blue or pink or orange or green in a particular place. I really wanted the colours to fall randomly and not have an "arranged" look to them. Squint. Move. Squint. Move. Squint. Move. Etc. I hope this has been useful to you but I also hope that you have fun experimenting with colours and shades, too. 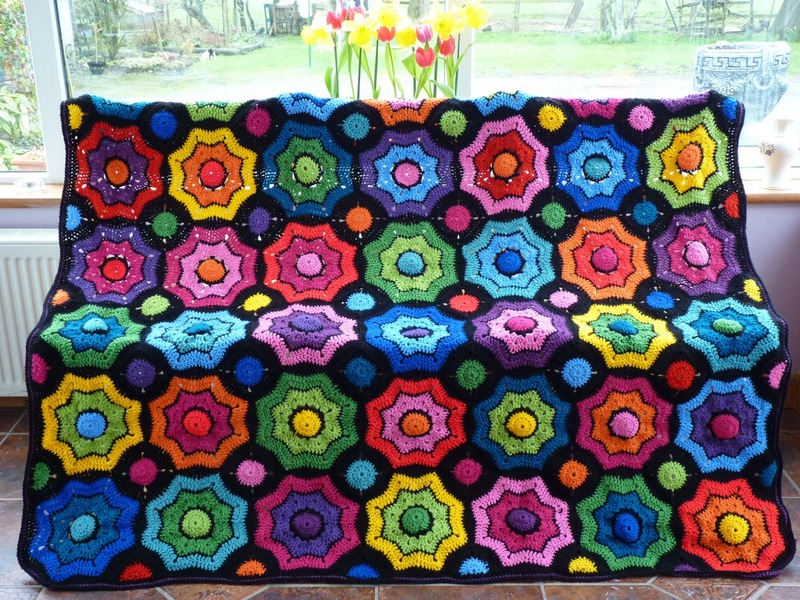 One reason this afghan was such a pleasure to make was the fun I had working with so many colours, mixing and matching yarns to find a colour combination that was pleasing to the eye.